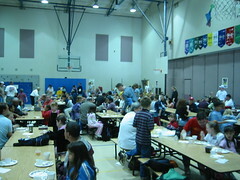 Friday morning the dads of Sidney Glen students were invited to have pancakes with their children at Sidney Glen. The PTA used electric grills in the gym to cook the pancakes. There was a great turnout, so unfortunately the grills got a little behind. But with a little patience, everyone was filled. On another note, we are thrilled that Lucas was hired at Orchard Heights as a fourth grade teacher. He competed with over 200 applicants. What a week for him - the lows of bad allergies and an accident on the way to the interview to the news of his hire! We are anxious to have he and Amy around in a couple of months.